Professors and schools insist on academic writing as a skill that all students must obtain. As a student, this is the first question that comes to your mind: "Why is essay writing so important? " The answer will convince you to try harder to complete these assignments properly: when you obtain this skill, you'll also be capable of critical thinking, proving your point with solid arguments, and conducting a relevant research about each matter you elaborate. Now that you understand the importance of this skill for any career path you choose, another question pops up: "Why is essay writing so hard? " The first reason lies behind the fact that teachers don't bother much to explain the task, but they expect you to deliver top-quality content. Plus, you have to write multiple papers by the same deadline, and you don't understand most of the topics you got. 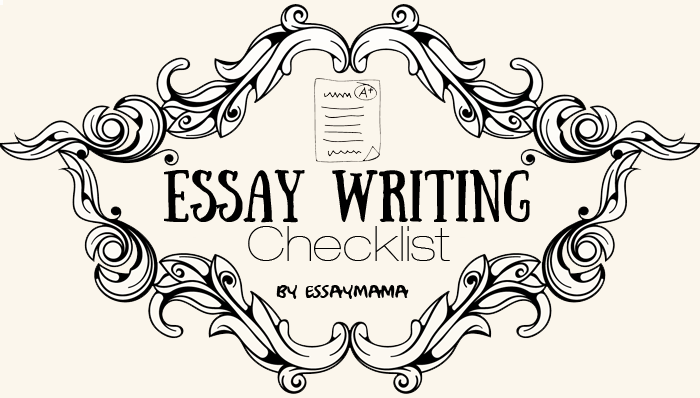 When your teachers are not by your side, you know where to turn: EssayMama is your safest resource. In this infographic, we will tell you how to tackle the process of academic writing with success. This checklist will prepare you to approach the task systematically: you'll understand the phases of pre-writing, writing and editing. First, you need to understand the essay question. Your professor simply gave you the assignment without explaining things further? Well, you have to ask yourself the right questions before you continue any further. If you don't understand the question, you'll end up with irrelevant content that won't get you a good grade. Once you get that part covered, you'll need to dig for the right resources. The infographic exposes the strategies that help you conduct a good research. The creation of the thesis statement has to be the most difficult part of essay writing. You need to answer the question, provide your opinion and capture the essence of the entire paper into a single statement. Then, you can start working on the essay's body. The infographic shows the aspects each paragraph is supposed to contain. The conclusion is very important; it's the section that forms the reader's impressions and leads you to a high grade. Your work doesn't end there. Without proper proofreading, you'll never be a successful essay writer. Rest assured that the careful eye of your teacher will notice all mistakes. There are two important things to focus on during this stage: eliminating grammatical errors and getting rid of contradictions. Once you go through the entire checklist presented in the infographic, you can relax; the paper is safe for submission.